How much will it cost, anyway? The costs to attend college for a full year go beyond the institution's advertised tuition. Don't forget there are additional room and board, books and supplies, personal and transportation expenses as well. The chart below shows the average annual full cost of attendance by type of college. Don't let these costs scare you from determining your college choice. Costs of attendance vary by institution and within institutions and the final net cost you pay depends on any financial aid or institutional discounts you may receive. So, make sure you check what financial aid is available to help pay for college. Few students will be required to pay the full cost of attendance. Make an informed decision, plan ahead and check out the estimated net price you would pay to attend specific Minnesota or out-of-state institutions. Tuition data for 2018-2019 as used for state grant purposes. Room and board and other expenses for 2017-2018. Costs vary by institution. Look up current college costs for individual colleges on the College Navigator. Students pay tuition for classes and instruction provided by the college. In addition, there are fees automatically charged for services such as the health center, library or student activities. This refers to the basic price of living at the school during the academic year. "Room" refers to housing, whether it's in an on-campus dormitory or off-campus. "Board" refers to the price of eating, whether it's in the college cafeteria or buying food and preparing meals yourself. Not all room and board options are available at all schools. Many two-year schools do not have on-campus housing. Some larger schools only have college housing for undergraduates or only for first- and second-year students. Some colleges do not allow students to live off campus until their third or fourth year. Contact individual schools for specific details. Unlike in high school, students in college are expected to buy their own books. In addition, they're expected to purchase their own pencils, paper, art supplies, calculators and computer supplies - whatever they need to complete their courses. See also: Reducing Textbook Costs: Campus Strategies for Students, Faculty & Staff. Regardless of the type of institution the student chooses, they will have some personal expenses such as laundry, clothing, recreation, medical care, insurance and so on. Students should plan to spend at least $1,000 each academic year on these items. All students spend some money for travel, whether they live on campus or commute to school daily. Students living on or near campus must travel there at the start of the school year and return home at the end. Most students also go home at least once during the year. Commuter students who travel to and from the school on a daily basis must carefully figure in the cost of fuel and parking or public transportation. Both can add up quickly. The transportation costs for commuter students are also built into the financial aid calculations used by the school. Minnesota students and families receive nearly $3.3 billion in financial aid or institutional discounts annually to help pay for college. The money comes from the state of Minnesota and the federal government, colleges, and private sources. There also are tax benefits and deductions that make what families have to pay more manageable. Use the U.S. Department of Education's net price calculator to help gauge what it might cost your family to attend a college of your choice anywhere in the nation. 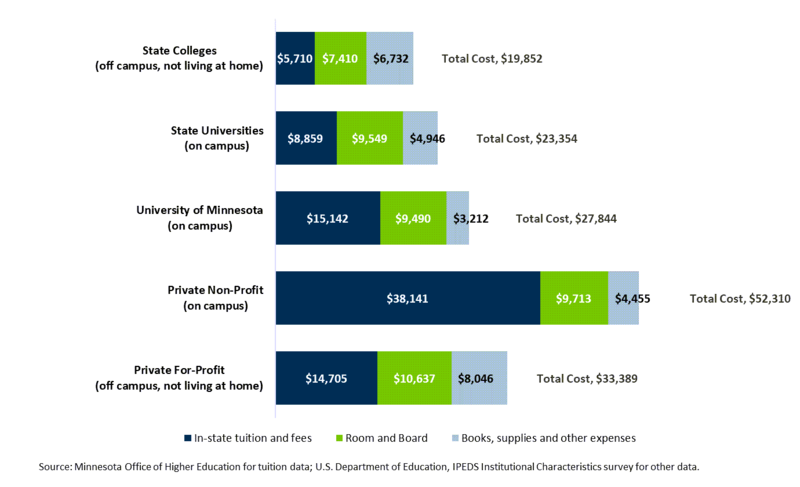 The net price estimates how much it might really cost to attend a particular college depending on family income and subtracting any federal, state and institutional aid undergraduate students may receive. You can also use our financial aid estimator for Minnesota colleges.